China, the hungriest and thirstiest energy market in the world, required the import of 3.5 million tonnes of Liquefied Natural Gas (LNG) in 2005. Furthermore it is expected that China will require a further 19 million tonnes by 2010. Construction of China’s first LNG terminal and associated high pressure pipelines is currently underway in China’s Guangdong Province. The new terminal will supply the region with 4 billion m3/year of natural gas. The province is currently the largest importer of LNG in China. The project was launched in 2002, and Phase 1 of the construction process, bringing the first LNG on-stream in 2006. The STTS Group, a French/Italian joint venture comprising Saipem, Technigaz and the engineering companies Tecnimont and Sofregaz, was awarded the Engineering, Procurement, Construction (EPC) lump sum turnkey contract for the project. Weir Valve and Controls were contracted to supply a range of control valves for the project. 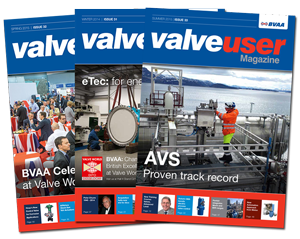 The valves supplied included butterfly valves, globe control valves and cryogenic globe valves. The valves were based on Weir’s standard BV500 and BV990 ranges and manufactured in stainless steel, the most common material used in cryogenic environments. Specially constructed cryogenic valve bonnets were fitted to the valves to ensure maximum heat dispersion and packing protection at cryogenic temperatures. The cryogenic valves were required to undergo a rigorous round of cryogenic tests to prove the integrity of the valve body and seals. When the valves were cryogenically tested, they were hydrostatically tested using water to prove the integrity of the body casting, seals and seat. They were then fully cleaned and dried ready for the cryogenic tests. It is important to get the valves fully dried out as even the slightest amount of moisture can make the valve freeze and stick in position during testing. The cryogenic testing was conducted by immersing the valve body into a bath of liquid nitrogen. The liquid nitrogen cools the valve to the desired test temperature which was then monitored by sensors located in a number of locations in the body assembly. The period of immersion in the nitrogen varied depending upon the size and body wall thickness of the valve. Once the temperature was stabilised, the valves were pressurised with pure helium. The valve body, packings and seals were tested for leakage using a mass spectrometer to detect the presence of helium in the atmosphere. 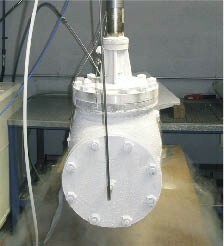 A closure test was also performed on the valve to ensure the integrity of the seat at cryogenic temperatures. Once the cryogenic tests were complete, the valves were slowly returned to ambient temperatures and retested to ensure the integrity of the seals. 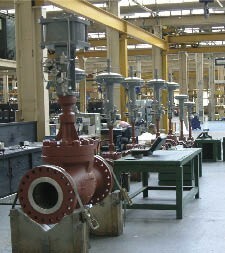 All of the valves passed this extensive testing and were supplied in 2006. Koso Kent Introl - What’s in a Name?